This is a simple dish that uses a jar of Chinese black bean stir-fry sauce. It is best served immediately, so prepare to step 1 and complete the cooking between the courses. Serve with plenty of rice to soak up the sauce. Heat a large frying pan or wok with the vegetable oil, add the onion and garlic and cook for 2-3 minutes on a medium-high heat, until the onions have started to soften. 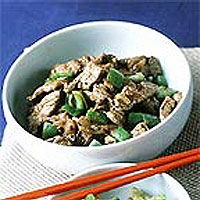 Stir in the thinly sliced beef and stir-fry for 2-3 minutes on a high heat. Add the peppers and cook for 1-2 minutes, pour the jar of black bean sauce over the meat and bring to the boil. Serve immediately.